HTTPS (HTTP over SSL/TLS) security is a requirement for many web applications. When properly implemented, HTTPS ensures that the traffic received was really sent from the expected endpoint, protecting the client and server. When a web application is secured via HTTPS, all resources, including web services, must also be secure. Fortunately, HTTPS support is ubiquitous and most of the plumbing is already in place. However, because HTTPS requires a machine-specific certificate, HTTPS is not enabled in the LEADTOOLS Medical Viewer and Service by default. More detail about each step follows. 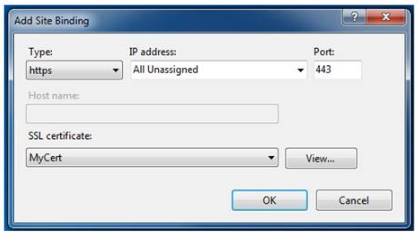 Create a certificate signed by an internal or domain Certificate Authority (CA). These certificates are usually trusted across the domain, but the IT department may need to be involved and it is possible that your organization may not have an internal CA. Although each client running the host will still need a machine-specific SSL certificate, some equipment (like scanners) could be shared. The drawback is that the certificate is only trusted on the machine on which the certificate is created. Purchase an SSL certificate from an external trusted authority such as Symantec (VeriSign), Thawte, or GoDaddy. This has the same benefits as a domain certificate, but does not require a domain certificate authority. The drawback is that this is the most expensive (and possibly prohibitive), option. There are many resources on the Internet that explain each option described above in more detail. For information about creating a self-signed certificate, refer to https://docs.microsoft.com/en-us/dotnet/framework/wcf/feature-details/how-to-configure-an-iis-hosted-wcf-service-with-ssl, and search for "Create a Self-Signed Certificate". 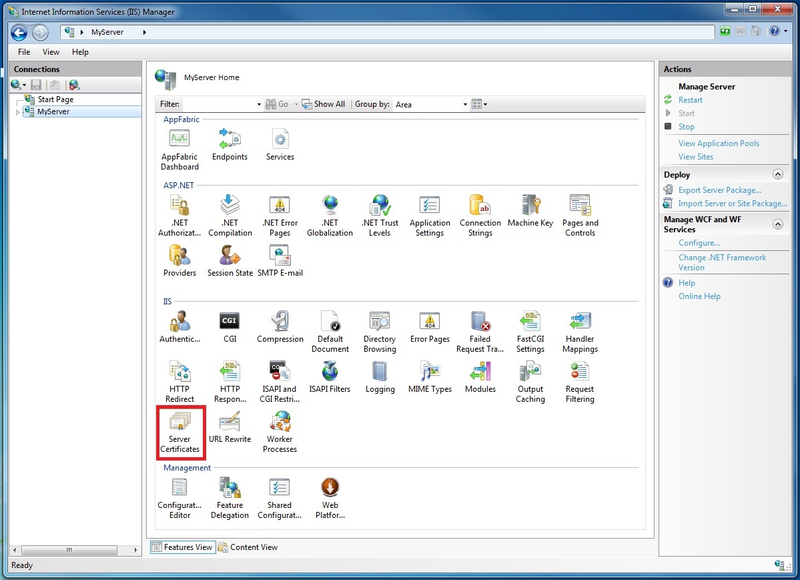 The advantage of this option is that it is free, making it a popular choice for development and internal deployments. The drawback is that the certificate is only trusted on the machine that created it. 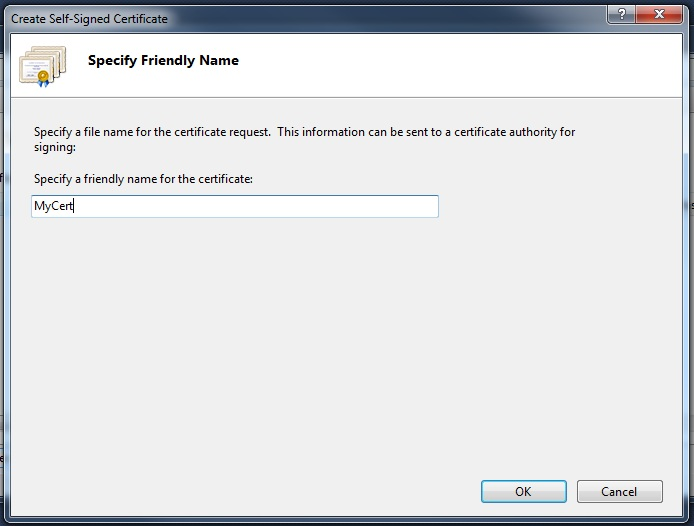 In the Create Self-Signed Certificate dialog, enter a friendly name for the self-signed certificate and click OK. See the following figure. The generated certificate is installed in the Trusted Root Certification Authorities store. 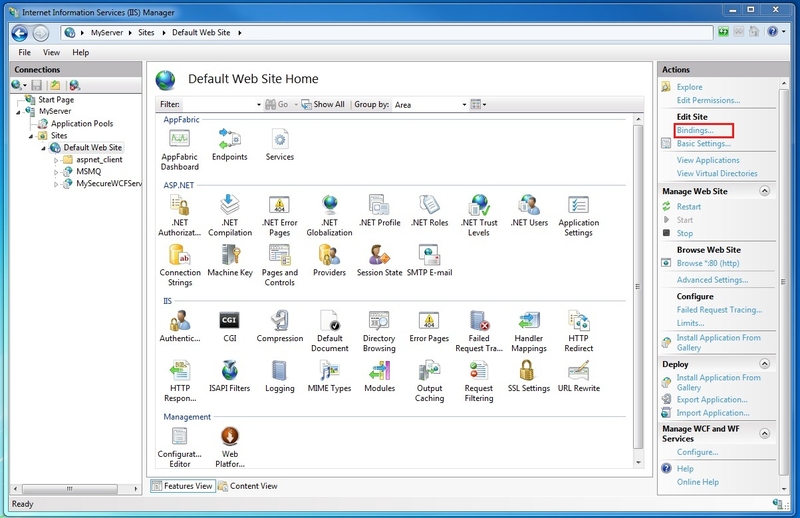 Still in the Internet Information Services Manager, expand the Sites folder and then the Default Web Site folder in the tree view on the left-hand side of the screen. 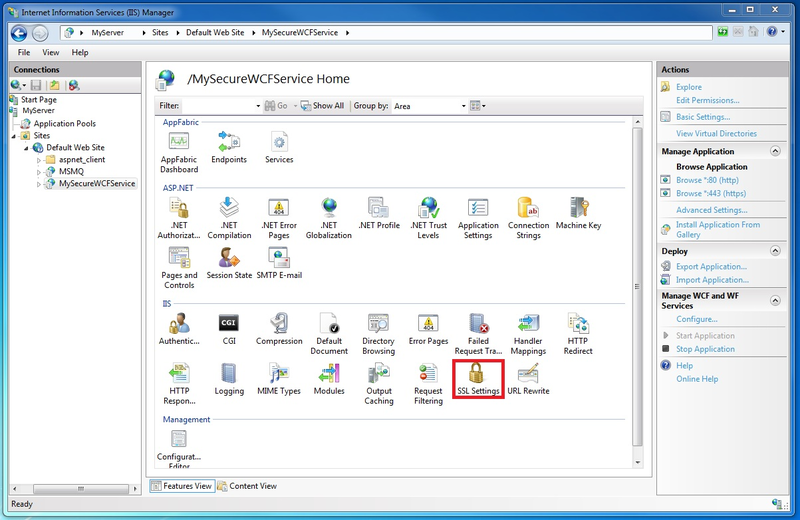 Still in the Internet Information Services Manager, select the virtual directory containing your WCF secure service. If the endpoint has bindingConfiguration="HandleLargeData", change it to bindingConfiguration="SSLHandleLargeData"
If the endpoint has binding="webHttpBinding" and has no bindingConfiguration defined, add bindingConfiguration="SSLBinding". Update all of the .svc files in the MedicalViewerService to remove the highlighted Factory attribute. Enabling HTTPS support is an important first step in bridging the gap between secured browser applications and the desktop. However, HTTPS is not enabled by default because a machine-specific certificate is required to encrypt the connection. Fortunately, the steps required can be performed easily and without necessarily having to purchase a certificate.